We are pleased to announce that a board of directors has been appointed for our soon-to-be nonprofit public benefit corporation “Hope’s Village of SLO.” The board is comprised of local homeless advocates who are working to establish a self-sustaining community village of tiny homes where local homeless adults, regardless of their backgrounds, will live in dignity and in peace. The village will provide a viable housing solution for more of our homeless neighbors and the most vulnerable – our women and the elderly, who are unsafe living on the streets. The board is now preparing bylaws and will submit articles of incorporation to operate as a 501(c)3 organization. Formal written agreements will be developed between the board of directors, the villagers and local government officials. All laws, agreements, and rules and regulations will be strictly adhered to. The village’s membership will be restricted to adult men and women. Each villager will have a voice and a vote in village decisions, and must contribute to the well-being of the village. Short and long term goals (and progress toward these goals) will be regularly reviewed in scheduled meetings at both the board and villager levels. Issues to be addressed include (but are not limited to) homelessness, work, public safety, sustainability, respect, and civic participation. The current hope is that land can be inexpensively leased from San Luis Obispo County on the outskirts of the City of San Luis Obispo. The villagers will work to design and build the residential structures (utilizing sustainable building methods) with the help of Central Coast community residents. Local fire, health, and planning departments will be asked to inspect and approve the buildings as they are being constructed to ensure all requirements are met. The village will be a model for sustainability and civic participation with the smallest carbon footprint possible. Our goal is to encourage interaction, cooperation, and a better understanding between our previously homeless neighbors and local community residents as they come together to build the village. There will be a “one-strike-you’re-out” culture; there will be zero tolerance for drugs, alcohol, theft, or violence. The village will have round-the-clock security for residents and property. The board of directors and villagers will work in cooperation with the SLO County Sheriff and SLO Police. We want to ensure their continuing support and will keep these agencies apprised of all aspects of our village. The village will have liability insurance coverage (under the auspices of the nonprofit) and will hold harmless the city and county of SLO for any liability they may have had concerns about. Most importantly, the village will allow formerly homeless people another chance for a better life. They will have the stability of a home in a safe and healthy environment. They will be held accountable for their actions. They will learn new job skills to enable them to obtain meaningful work. They will be encouraged to start (or continue) their education, and to take advantage of the many services available to them at agencies in our community. Our board also looks forward to working in conjunction with these agencies. Thanks to our caring community and government, more of our homeless neighbors will be able to live in safe and healthy homes, and help promote the same for others — and have hope for a better future. Our village will eventually be self-supporting. However, we have start-up costs and invite you to participate in this project by making a financial donation. (Future contributions will be tax deductible when our nonprofit status is finalized.) Checks can be made to Hope’s Village of SLO and deposited at any Sesloc Federal Credit Union branch, or mailed to Hope’s village of SLO, P.O. Box 100, Santa Margarita, CA 93453. We’re very excited about this project, and welcome your ideas. Thank you for your interest. Becky Jorgeson is a long time supporter of the homeless and the founder of Hope’s Village of SLO. 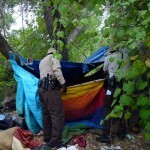 The homeless should have a place designated for them to camp, here is the problem, so long as it is not by my house. One strike and you’re out? You shouldn’t need to much real estate for that one guy. Why not just let them camp out at DeVaul’s? Oh, I know; to much pressure from Dan’s new high and mighty zillion dollar neighbors. I certainly hope your not the same person who spoke on the David Congalton show, if you were, I heard all your sympathetic BS and thats what it was because I do know. If that was you, I distrust your sincerety, I distrust your competence and integrety. Your are merely creating your own enterprise. I certaintly hope you are not that same person, I will find out, If you are I will post why your FOS. I hope your not her! What if SLO gets too filled with freeloaders from outside? Are you prepared to handle? My main concern are for our own native homeless first!